Cosmos 1, the world's first solar sail spacecraft, has shipped in preparation for a launch window that opens on June 21, 2005, traveling from the test facility of Lavochkin Association in Moscow to Severomorsk, Russia. The innovative and first-of-its-kind solar sail, a project of The Planetary Society and Cosmos Studios, will launch atop a converted ICBM from a submerged Russian submarine. It will deploy in Earth orbit and attempt the first controlled flight of a solar sail. Once Cosmos 1 achieves Earth orbit, the mission team will spend the first few days monitoring the spacecraft and allowing any remaining air in the packed blades to leak out before deploying its eight solar sail blades. This will be so cool...watching this manmade object glowing as bright as Venus, across our skies! Russia has dispatched a solar-sail spacecraft and a space parachute to waters off its northern coast to be launched from a submarine in the Barents Sea. The unmanned spacecraft with eight triangular sail blades, each 16.5 yards long, and a new inflatable deceleration device, have been dispatched to the main administrative base of Russia's Northern Fleet, Severomorsk, the Lavochkin production and science association said. The spacecraft, called Cosmos 1, is to be launched on June 21. The launch had been planned for March but was postponed, because the preparatory work had not been completed in time. Scientists will study the possibility of using a solar sail as a propulsion system and as a way to control the spacecraft during its orbital flight. The spacecraft is being built under contract to the U.S. Planetary Society. Other participants in the testing of the device are the European Space Agency and the European Aeronautic Defense and Space Company. Excellent! All is on schedule and it will be great to see this object shining brightly overhead as it passes by. The world’s first solar sail spacecraft, Cosmos 1, is now mated to its Volna launch vehicle and ready for its ride into space. This is a great milestone in Planetary Society history: we have produced a fully qualified spacecraft and have it (figuratively) on the launch pad. Of course, we are not on a launch pad at all. Cosmos 1 sits on a rocket about to be placed into a submarine. 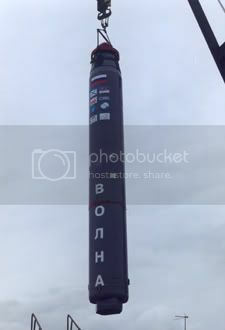 The rocket Volna (“wave” in Russian) is an intercontinental ballistic missile with its warheads replaced with our spacecraft and the orbital-insertion motor that will lift it to the outermost edge of Earth’s atmosphere. Now we are ready to ride a wave into space. When Cosmos 1, the first solar sail spacecraft, launches on June 21, 2005, it will carry into Earth orbit a CD containing the names of over 75,000 members of The Planetary Society and the Japan Planetary Society, along with the works of early visionaries who inspired solar sailing. Cosmos 1 is a project of The Planetary Society and Cosmos Studios. Built in Russia, it will launch atop a converted ICBM from a submerged Russian submarine in the Barents Sea. Data obtained during the flight of Cosmos 1 will assist the world space community in analyzing and developing future solar sail technologies, such as those presaged on the CD in an historic essay by F.A. Tsander and a science fiction story by Arthur C. Clarke. See the full CD contents at www.planetary.org/solarsailcd/. I wonder if it just the cd, or if there is a player along with it and speakers? A cd by itself, while noble, is rather pointless.